Given that our club name includes "Golden Retriever", it is natural to expect that our members own Goldens. While this is absolutely true, we also have members with several other breeds. Before applying for membership in the club, you should attend at least one membership meeting, which are most often held on the 3rd Saturday of the month, often in conjunction with one of the club's activities. You are also required to have two members sponsor your membership. Part of the membership form includes this provision: "I agree to abide by the Constitution and Bylaws of the MGRCM...". You can find them at this link. Open the membership application (as a PDF document). Download the expense reimbursement form as an Excel file. You can find minutes to the club's board meetings and club meetings here. 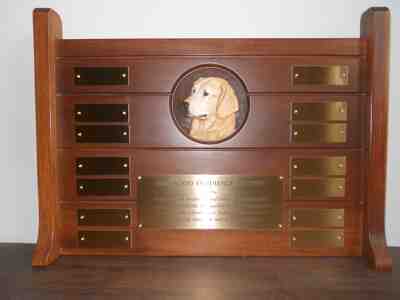 Marshbanks awards several trophies on an annual basis to members and their dogs. The following are pictures of the awards, the requirements for the award, and the forms you need to fill out and submit to the Awards Chair. To see pictures of the awards and read about the requirements, click on the link in the left column. To see the related form, click on the link in the right column. 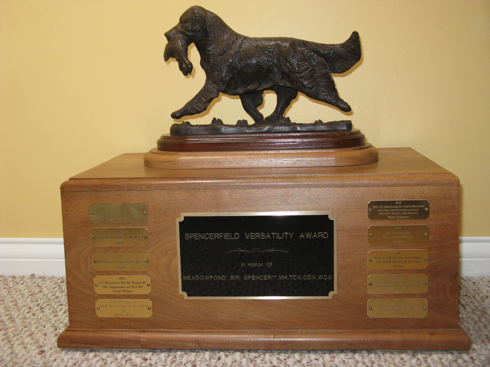 This trophy, awarded by Walt and June Faubion, is awarded to the dog earning the lowest qualifying score, regular class, in obedience for the year (AKC, CKC, UKC). Members should fill out this form and submit it to the Awards Chair. 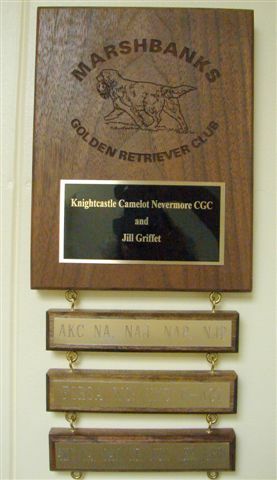 This trophy, offered by Ed and Marallyn Wight, in honor and memory of Kyrie Genever Am/Can UDTDX, WC, first Golden Retriever to earn a TDX at a National GRCA Specialty, Anthea of Setherwood Am/Can UDTDX, first Golden Retriever to earn a TDX in Canada, and all their other tracking Kyrie Goldens, is a traveling trophy to be engraved with the member's and dog's name earning a tracking title (TD, TDX, VST, CT) from the AKC or CKC. The trophy may be held by each titlest until the next one earning a title. It should be presented at the next Club meeting, or the Annual Banquet, whichever comes first. When members earn a new title with their dog(s),they should fill out this form and submit it and any payment required to the Awards Chair. In Memory of HRCH Riverwoods Grizz L'Bear CD, MH, WCX - "Grizz"
The Riverwoods Hunting Trophy is awarded annually to recognize the handler and Golden Retriever team that has achieved the highest point total on the basis of successful completions of Hunting Tests for Retrievers (AKC and UKC) and Working Certificates for Golden Retrievers (GRCA). The purpose of the Riverwoods Hunting Trophy is to encourage active and continuing participation in non-competitive field events by members of the Marshbanks Golden Retriever Club of South Central Michigan ("Marshbanks"), and to acknowledge the achievements of Golden Retrievers in the field. Handler shall be a full, associate or honorary member of Marshbanks in good standing during the year of the award. Handler shall have been the owner or co-owner of the dog at the time the events took place. The dog shall be a Golden Retriever. Hunt Tests shall be events licensed by the American Kennel Club (AKC), and by the Hunting Retriever Club of the United Kennel Club (UKC/H.R.C.). Working Certificates and Working Certificates Excellent shall be events approved by the Golden Retrieve] Club of America (GRCA). Trophy points shall be awarded for an individual dog on the following basis for each qualifying event during the calendar year. Working Certificate/Excellent points shall be credited for each time the dog qualifies. Honoring the Memory of SHR St. Andrew Baron of Riverwoods CD, JH, WC - "Bear"
The Riverwoods Novice Hunting Award is presented annually to recognize a Handler/Dog team that ha earned two or more Novice hunting titles during the calendar year. 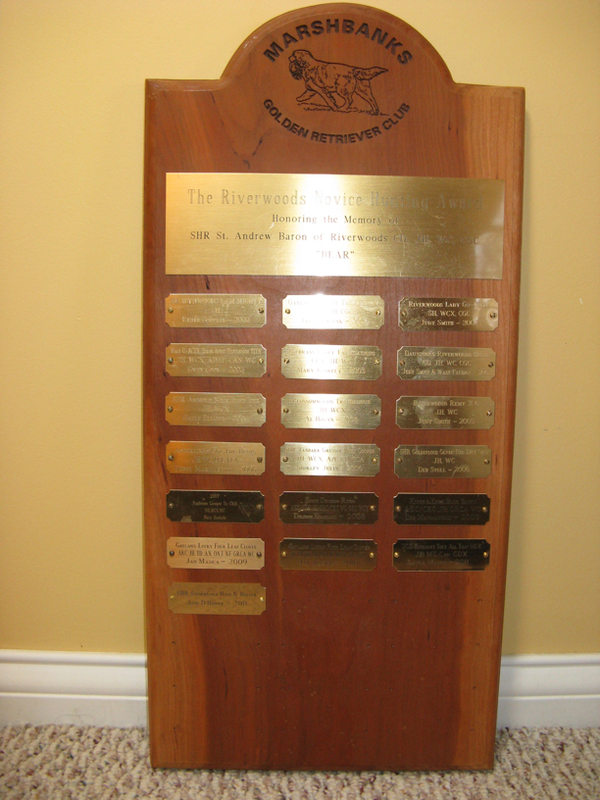 The purpose of the Riverwoods Novice Hunting Award is to encourage active participation by member: of the Marshbanks Golden Retriever Club of South Central Michigan ("Marshbanks") in the hunting test programs of the American Kennel Club (AKC), the Hunting Retriever Club of the United States Kennel Club (UKC/H.R.C. ), and the Golden Retriever Club of America (GRCA). The dog must earn points in at least two different categories. In event of a tie, the award will go to the dog with the dog representing the greatest number of categories (breadth). Points will be awarded for AKC licensed events and GRCA events only (WC, WCX, CCA). In order to receive the points, the owner must handle the dog. Dogs handled by a professional or person other than the owner will receive 1⁄2 of the points indicated. 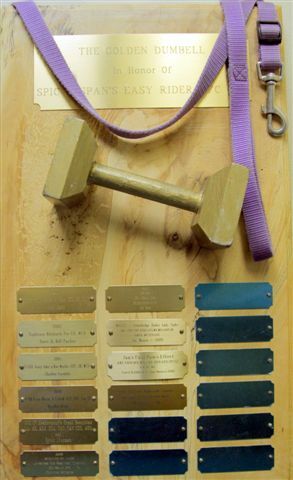 This trophy is offered by Jan Masica, honoring the memory of MACH2 Stonehedge Hades Lady Sadie, VCD2, VCX, MX, MXJ, AJP, TDX, CDX, JH, WC, CCA, CGC. The purpose of the award is to encourage handlers to continue to train and compete in a variety of venues with their senior retrievers. This is a traveling trophy. All retrievers, 7 years of age and older, who have earned either an AKC Versatility title, a GRCA Versatility title, or a Versatility title from their respective breed national club, during the calendar year are eligible for the award. More than one dog may receive the award within the year. NOTE: ALL RETRIEVERS are eligible for this award. This trophy is offered by Renee Schulte. It is awarded to the member-owned Golden Retriever with the highest average from all AKC qualifying obedience scores earned for the calendar year. Scores to be earned in Novice A/B, Open A/B and/or Utility A/B. If you download the Excel file (Wynwood Obedience form), you can enter your scores in the appropriate column and it will do the math for you (total and averages). If you prefer to print it out and write in your information by hand, use the PDF file (Wynwood Obedience form (PDF)). Please return your completed form to the Awards Chair.